Growth is built into the dental services offered at the Burlington Community Health Center. The services began in October of 2016 with only two chairs and operating only two days a week. By the following month, the services were being offered three days a week and, by the spring of 2017, they should be offered four days a week. Plans call for the health center to have six dental chairs within two years, according to Katrina Mattison-Chalwe, Piedmont Health Service’s Dental Director. It’s not that dental patients are overrunning the health center yet, Mattison-Chalwe said. But she said she expects the patient load to grow and is planning for it. 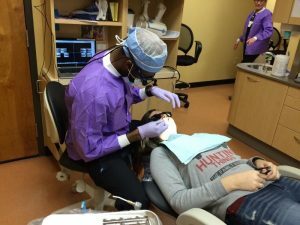 The new dental services at the Burlington Community Health Center, which were funded by a federal grant, are the first offered by Piedmont Health in Alamance County. While there are other dentists in the county, the new services at Burlington fill unmet needs, Mattison-Chalwe said. The services are affordable, accessible and convenient she said. Burlington Community Health Center charges on a sliding-scale basis, depending on income, Mattison-Chalwe explained. That is particularly important because a lot of the patients are referrals from the Open Door Clinic of Alamance County, an organization that helps indigent and uninsured residents find affordable health care. Many other patients have health insurance but find that it is easier to get access to timely appointments at the Burlington Community Health Center. The health center can offer appointments in a week or two, she said. In addition, the service has a lift that allows dental staff to give treatment without patients having to leave their wheelchairs. The lift minimizes risk of injury to both patients and staff associated with transfer from a wheelchair to a dental chair. It is especially helpful for the department since it has a partnership with Piedmont Health SeniorCare, Piedmont Health’s Program of All-Inclusive Care for the Elderly – which is housed in the same building. “We try to reach everybody,” Mattison-Chalwe said. 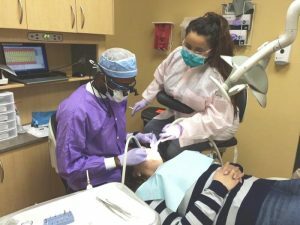 The health center works with the school system, resource fairs, community-based programs and churches to find patients who need dental care, she said. But she said they are not trying to take patients away from existing dental practices. Piedmont Health CEO Brian Toomey noted that various other agencies and organizations were instrumental in Piedmont gaining approval to establish the dental practice, including the Cone Health Alamance Regional Medical Center, which helped in various ways including financial aid and assistance in preparing the statement of need; the Alamance County Health Department; the Open Door Clinic; Allied Churches of Alamance County; the Alamance-Burlington School System; and the United Way of Alamance County. Dr. Douglas Sanford examining a patient at the Burlington CHC. Dental Assistant Junix Hernandez working with Dr. Douglas Sanford.